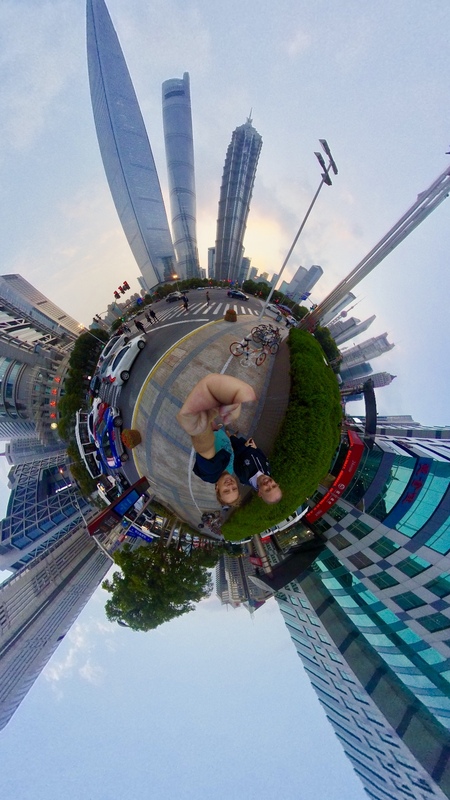 I guess it’s a good place to start explaining our travels to the ‘Far East’. Since 2012, FatStick has been there…providing boards, giving folks the opportunity of getting on the water without having to spend large amounts of their hard-earned cash on boards. However, the ethos that sits behind the ‘FatStick Ethos’ – [stay with us here] – is quality. We don’t like the word ‘cheap’. It carries with it, negative connotations and the impression that, if you’ve not seen, touched or felt a FatStick board, our boards are ‘cheap’ly made. This couldn’t be farther from the truth. We are proud of our provenance and our Research & Development, however, our methods were taking too long. We were ordering samples, awaiting their delivery and then sending adjustments before any large amount of boards were even ordered. This meant long lead times, a lack of stock over the busy periods and more importantly, a loss of potential family members. Why China? 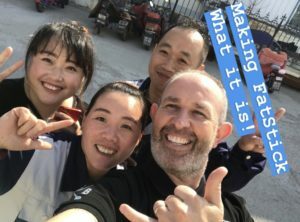 Not a lot of people are aware that the majority of boards in the Stand Up Paddleboard industry, both rigid and inflatable are manufactured in China – notice we said ‘the majority’ and not ‘all’. Just before you start jumping up and down on us. So with that in mind, the sensible thing would be to visit the boards at the source and talk through our [your] wants and needs before the boards are actually made. A win for us – saving on costs. A win for you – boards available throughout the year (yes – even in the summer). Why now? Well now, that’s your fault! But ‘fault’ as in a good fault. Since 2012, FatStick has steadily grown and the growth has been manageable from the shores of the U.K. however, since 2017, the growth of FatStick as a Brand, not just its sales, has meant that it has now become necessary to start to look at the origin and provenance of our products. To start to unpick the fabric of where they come from, what goes into the making of the boards, who makes them, the processes and from our point of view, we get to hone what is good, discard at the source what is bad and working with a very clever lady in China, we also get to reduce our usage of the dreaded Single Use Plastics. We can’t think of anything, however, if you can, ask us. FatStick, as a brand, a group of people and as a business consider ourselves open, transparent and above all honest. What use is telling a few ‘fibs’ here and there? They’ll only come back to haunt you – better to be upfront and honest from the start. There are some brands that we are lucky enough to talk with that are tentative about revealing the origin of their boards, however, if the boards are good and you have a great family behind you, why not let folks see the whole process. 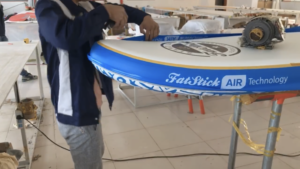 It would be lovely to think of some amazing Surf Goddess/God standing on a Hawaiian beach shaping a board whilst examining an epic break or maybe a British Factory being able to turn out the same volume, but for now, until that amazing person opens a UK factory, FatStick will keep doing what it’s doing and working with some clever folk in China. We hope that you will get to see all you need to see and we will be returning to our factories in the new year, so if you have anything else you’d like to know, just ask.